The only way to eat a fresh oyster is to have it shucked right in front of you. Oyster Factory is the first French mobile oyster bar. Based in Paris, Oyster Factory was inspired by New York consumer trends, the forerunner of this new movement. We invite you on an innovative culinary journey to accompany your prestigious events: Business events, marriages, private dinners, receptions, seminars, private parties. The appeal of our service lies in our unique way of serving oysters and the interactive experience between our charming Oyster hosts and your guests. With their tailor made equipment, our Oyster hosts mix in with your guests, shucking and serving the highest quality oysters. The perfect occasion for your special celebrations, the oyster is an exceptional product that our staff serves throughout the year, topped with our secret sauces developed by our private chef. We see to it that our Oyster Hosts are perfectly equipped to come to your event space and offer the best possible customer service. 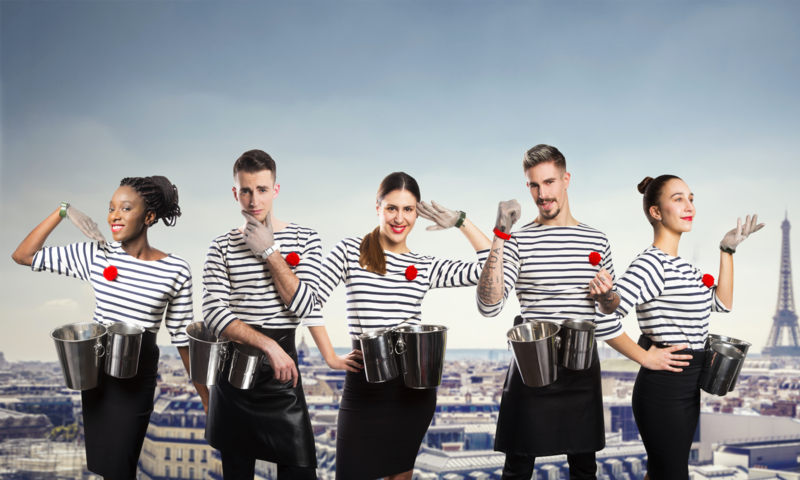 Our Oyster Hostesses wear a striped black and white jersey with a red pompom, a personalized apron, black skirt, mid-rise heels, hair tied and with simple make-up. Our Oyster Hosts wear smart black trousers, a striped black and white jersey with a red pompom, dress shoes, clean cut hair and a well-kept beard. Note: In accordance with your event the uniform can be adapted to your needs.